What could be better than a sunny beach, gentle waves, a comfortable chair, a cold beverage and, of course, your viola? Live life to the fullest – because Life’s a Bratsche! (Um, except when you have to be practicing or rehearsing, that is!) Cheers! Any violist would love to receive a gift with this design! 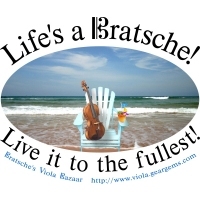 Buy this upbeat, stylish design now on any t-shirt, hoodie, tote bag, mousepad, mug or other quality giftware or apparel item, exclusively from Bratsche’s Viola Bazaar!